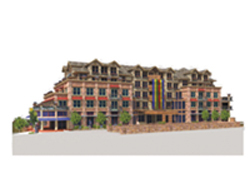 Rendering courtesy of Michael Blash & Associates The Gateway Hotel is a 200,000-square-foot, 200-room hotel that could be built at the corner of Main and Rivers streets in Ketchum. The Ketchum Planning and Zoning Commission will take a look at the proposal on Monday, May 14. In Bellevue, is the third time a charm?